Which is more effective for treating substance use disorders – online or in-person interventions? A recently released study of addiction treatments by Yale University compared the effectiveness of online therapy to in-person methods and drew a conclusion that might offend readers with Luddite leanings: web-based treatment is not only as effective as in-person treatment but possibly more so. That conclusion could lead to head scratching. How could someone with a condition as serious as a substance use disorder (SUD) possibly do better with a one-way technology solution versus a two-way interaction that in-person treatment provides? Recognizing that one study does not a best-practice make, a healthy internal Beacon Health Options discussion emerged, and we decided to do a little more digging. The Yale University study divided 137 users of alcohol, opioids, cocaine and other drugs, diagnosed with an SUD condition, into three groups: 1) weekly group therapy meetings in an outpatient setting; 2) individual cognitive behavioral therapy (CBT) sessions; and 3) an online program, CBT4CBT, which used multimedia content, including actors showing CBT coping strategies and interactive exercises and quizzes. This last group also met with a therapist weekly for 10 minutes to monitor progress. Approximately 75 percent of the online group completed the treatment whereas it was about half for each of the other two groups. By the end of treatment, 67 percent of the online group no longer met criteria for substance use versus 52 percent for the one-on-one CBT sessions and 43 percent for the weekly outpatient group therapy. It’s important to note that one of the study’s aims was to determine what type of person does better with in-person treatment and what type responds better to computer-based treatment, according to the study’s senior author, suggesting that the use of technology may not be an either/or proposition. What does other research say? Looking to shed more light on the efficacy of online versus in-person treatment for mental health and SUD conditions, we delved deeper into the research. Here is some of what we found. Not everyone agrees, of course. An editorial in Psychology Today asserts that while online therapy can have its place, in-person treatment is still the “gold standard”. One point made is that in-person therapy is a form of social interaction, which in itself can be therapeutic. Does technology in general contribute to our sense of loneliness and isolation? Does online therapy only exacerbate that general malaise? Not surprisingly, our quick research into this question is inconclusive. Perhaps a brief historical juxtaposition might provide perspective. Five centuries ago, the advent of a “new technology” expanded access to knowledge for the common person, transforming knowledge-exchange from a social/oral transfer to more of a self-serve cerebral process. Social commentators of the time might have easily warned that this technology would erode the community fabric. The new technology? The printing press. Did it cause people to be lonelier or more connected, more depressed or more enriched? The reasonable answer is that it predominantly depends on the person. While the current research on web-based services may leave us still wondering, Beacon continues to rely on a fundamental principle: the importance of person-centered care. We fully expect that this guiding principle will evolve along with the rest of healthcare to include the potential use of technology. As with most aspects of healthcare, what works for one person may not work as well for another. The use of new technologies is no exception. Which approach to take – online, in-person, or perhaps a blend of the two – is a decision to be made between the clinician and the individual. Any choice of treatment modality requires thoughtful responsiveness to a person’s personal preferences, beliefs, and actual progress toward self-determined goals. 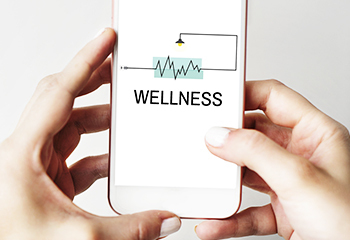 Health and wellness technology platforms are burgeoning, and as in any industry, not all are created equal. If choosing to go an online route, be sure to do your research. Are claims of outcomes superior to in-person treatment supported, for example? By landing in the not-one-size-fits-all category, the above research findings confirm, once again, the importance of person-centered care. If we keep our sights on the improved health of the individual, how we get there starts to fall in place.